Being An Ally | CHATmosphere! According to the Merriam-Webster dictionary, being an ally is defined as “one that is associated with another as a helper”. The same goes for the New Oxford version “a person or organization that cooperates with or helps another in a particular activity:” Any way you put it, an ally is there to help another person, community and in some instances a country when they need that support. Historically, there were allies assisting to free Africans being enslaved in the United States, America served as an ally to European countries during World War II. And civil right activists were allies to the thousands of African-Americans fighting for civil rights guaranteed to them by the Constitution of the United States of America. Most recently, there has been a movement across the country of young people, educators, and parents supporting lesbian, gay, bisexual, transgender, and queer youth as allies. Allies play a vital role in making schools safer for all students, regardless of sexual orientation or gender identity/expression. In fact, the first Gay-Straight Alliance was the idea of a straight ally. Although this isn’t a “new” movement, recent headlines about anti-LGBTQ bullying have brought to light the importance of allies to the LGBTQ community. Personally, as an ally I have had very rewarding experiences that made me really proud of what I stand for. Those experiences made me realize that the work I do isn’t in vain. In early October, a good friend of mine asked me, “What would you think of me if I told you I was attracted to men?” I told him, “I would think of you the same – who am I to tell you who you care about is wrong?” From then on he told me about his feelings and how he has been holding them in because he doesn’t want to be a part of the stereotype that society has created for gay men. He doesn’t want anyone to look at him differently because of his sexual orientation. We attend a university that is the most diverse in the North Carolina school system, and yet there is stigma around being a gay African-American male. Being there for him was the best feeling I could have ever felt. After talking to me, he has since made strides in coming out to his peers and wants to tell his mother soon. I remember he told me once “I respect, support, and appreciate straight allies because they are the ones in society that are ‘normal’ in strong support of something that society sees as ‘abnormal.’ You all take the slack for all of that.” Although I let him know that he is in no way abnormal or wrong for his sexual orientation, I appreciated his words. I felt like I had a purpose. You, too, can be an ally. High school students can join their gay/straight alliance at their schools, or if there isn’t one make an effort to be the founding member. College students can also join an organization that advocates for the issues relevant to LGBTQ youth. Within in that organization, plan a project, pass out flyers, ask questions, and most importantly, BE AVAILABLE! Go out into your communities and tackle the issues that relevant to the people around you. Take notice of abusive language, support your friends and their events. The Gay Lesbian Education Network, Advocates for Youth, and YouthResource are all great resources on how to plan events on campuses and in communities and ways to speak to your peers to ask questions to be a better ally. I hope that the information that I have provided to you will make you more aware of the people around you and I hope that I have influenced you to stand up for the youth in your communities. Be the change. The Gay Lesbian National Hotline: 1-888 843-4564 (M-F 6:00 PM-11:00 PM). 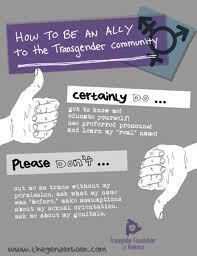 Share your own stories of being an ally. What does it mean to you? How important is it? This entry was posted in Uncategorized and tagged Africans, ally, Amara, Bisexual, Bullying, Gay, GLSEN, Harassment, Helper, Lesbian, LGBTQ, Merriam-Webster, National Gay and Lesbian Task Force, Nazi, New Oxford, North Carolina, October, Queer, Stigma, The Trevor Project, Transgender, Trevor, United States by CHATpdx. Bookmark the permalink.